Have you ever wonder how it was possible to build your Google+ fan base ? It is easy, of course, to find who have you in circle, but not to know who has ever shared one of your article. Say you are writing on several blogs and want to collect the list of people who shared it on Google+ , now an easy solution exists on WordiZ.it . I am really excited to describe this new feature because I am using it quite extensively since it is available. I really think it helps your content marketing or social media strategy. Basically, it does only one thing : showing the people who put a link to your article on Google+. That’s it, nothing more, but there is a very deep scope behind that simple feature. When you are writing an article on the web, you want to maximize mainly one thing : interactions. Interactions on your post could be seen as views, number of comments, incoming links or social media mentions. You cannot really do anything with the number of views, but you can engage people who create links, comment or share your post. That simple action will allow you to get more engaged readers and to turn them to ambassadors or fans. So, you probably understand now how the new feature works. 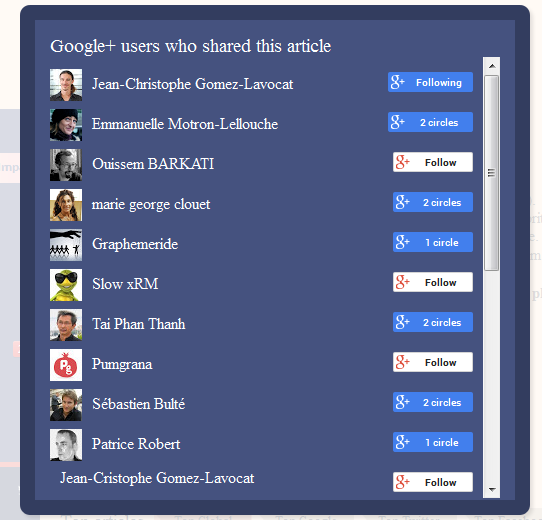 Publish on the web and WordiZ.it will collect automatically your articles and list all your Google+ sharers. Under your profile tab, you will find the link to this list. Open it, and you will be able to add any single fan to a dedicated circle, something like “my G+ readers” for instance. Then, what to do next is up to you. You can either ping them when you publish something new, or just say “thanks” for their involvement … You can also comment below and tell us how you would use this feature. In addition to an author-wise fan base, we also wanted to give you the opportunity to connect with people who shared a specific article. So, for all your top articles, you will find a quick link to “G+ fanbase” to see who exactly shared this article. This way, you will easily be able to see individually who helped you to get your articles to the top. That’s a really great tool to create connections.